This book was recommended to me by Erik, from ThisKidReviewsBooks. In fact, he reviewed it in a guest post here on my blog. This summer, when he reviewed the sequel on his blog, I decided book one might be a great read-aloud to start out my son’s homeschool year. Erik assured me he would love it, so I ordered it from the library. It was a great way to start out the homeschool year. You see, reading is unimaginably difficult for my son. While he’s old enough that he should be reading novels like this with ease, he’s only just outgrown Magic Tree House books, and he still frequents The Boxcar Children (for which I’m very proud of him—he couldn’t read those independently at the beginning of last year). Anyway, he’s a normal boy who loves high-action, super heroes, things that blow up. He just can’t visit those worlds without help yet. So I read this one to him. (It weighs in at 468 pages.) It took us three weeks and two days, but it blew him away! Within, Jack Blank is so named because no one actually knows his last name. Or who his parents are. Or his past. As long as he can remember, he’s been a ward of St. Barnaby’s Home for the Hopeless, Abandoned, Forgotten, and Lost. He’s an orphan who doesn’t really fit in anywhere. Not even at St. Barnaby’s. So imagine his thrill when an emissary from the Imagine Nation (a real live world right out of his comic books) comes to take him away. Of course, that was right after a Robo-Zombie emerged from the swampy water of St. Barnaby’s flooded basement and tried to kill him. The Imagine Nation is the stuff of dreams. There are awesome weapons, flying vehicles, intelligent machines, and an ultimate techno-city, Empire City. (My son loved it!) And everyone who lives there has superpowers–the heroes, the villains, and Jack! But the Empire City is a fearful place. A great battle was fought there in recent memory, and fears that the invading Rustov Robo-Zombies will return is very great. When it’s learned that Jack is resistant to the Rustov virus he’s found to be infected with, he is regarded with deep suspicion, especially by Jonas Smart, one of the ruling Circlemen who is using the public’s fear to grab power for himself. And that is the positive message I was sort of surprised to uncover in this ultra-techie, blow ‘em up, bigger-than-life superhero story. That, along with themes of loyalty, friendship, courage, and honor—all developed without one single profanity. Wow! I have to hand it to Mr. Myklusch. He managed to thrill my son with supers, intrigue, suspense, and mega-imagination, and he did in a positive way. 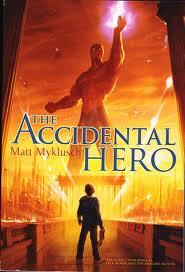 Two thumbs way up for The Accidental Hero! The sequel is EVEN better!! PS Thank you for the shout-out! Awesome! Micah’s been begging me to get it but we had some books we had to read first. We’re on our last one. That’s one big book for a young kid. How did you survive reading out loud that many pages? Glad he enjoyed it! Great time together. He never wanted me to stop! I had to get a drink a few times, lol.